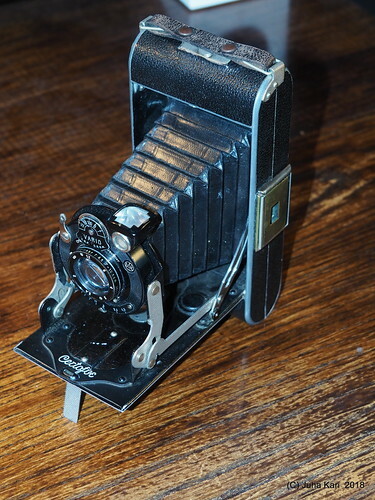 The Certofix is a vertical-folding camera for 6×9 cm exposures on 120 film, made by Certo in about 1930. According to McKeown, this model was first renamed the Certotix, and very soon afterward renamed again to the Certix, in 1931. He lists only the Radionar lens, and the Vario shutter (but the example illustrated here has a Pronto). ↑ McKeown, James M. and Joan C. McKeown's Price Guide to Antique and Classic Cameras, 12th Edition, 2005-2006. USA, Centennial Photo Service, 2004. ISBN 0-931838-40-1 (hardcover). ISBN 0-931838-41-X (softcover). p194. ↑ The serial number of 355xxx given for the lens on the example pictured supports a date of 1930-31; see Age of Lenses at Schneider Optics. This page was last edited on 5 October 2018, at 05:14.